The first mosquito of the year drifted into an open window yesterday. There’s still snow on the ground, but at least one mosquito was ready for spring. Or would have been, if I hadn’t done what I always do with mosquitoes. Flies, wasps, even the massive guêpes, the local hornets as big as my thumb – all get a pass from me. If they wander into the house, I shoo them out the window. Ditto for spiders, which get trapped and removed in my humane spider trap. Not so for mosquitoes. No one has any love for the mosquito. At worst, they are reliable bearers of disease, at the best they are a nuisance; they make summer nights noisy with their high-pitched whines and summer days uncomfortable with their bites and itches. Much of environmental and conservation study goes into the life forms we consider valuable, unique and indispensable. But what of the unloved mosquito, the ubiquitous creature we would like to see eradicated? The magazine Nature published an 2010 article in which several mosquito experts said that, while mosquitoes provide massive amounts of feeding potential in a number of environments, there’s nothing they provide that couldn’t be provided by other insects, and with much less nuisance. Mosquitoes carry malaria, yellow fever, dengue fever, Japanese encephalitis, Rift Valley fever, Chikungunya virus and West Nile virus, to name a few. There are 3,500 species of mosquito, of which only approximately 200 attack humans. Present on almost every continent and in every ecosystem, they have been evolving with their surroundings for an estimated 100 million years. In some areas, they form swarms thick enough to asphyxiate animals. 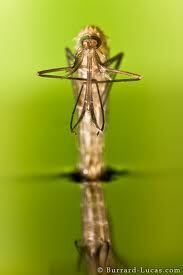 Mosquitoes have adapted to the abbreviated summers of the far north by breeding in vast numbers. A recent article in the New York Times looks at the ethics of the many disease-related research projects which focus on the mosquito. From genetically modified forms of diseases being inserted into the mosquito food supply to breeding wingless forms of female mosquito, many methods are being investigated that would stop the spread of disease. But if even the simplest method – the lowly mosquito net – has prompted species adaptation (some species now feed earlier, before humans have gone to bed under a net), what adaptations will other interventions prompt? A group of bright teenagers had the idea that if diseases could be delivered via mosquito, why not vaccines as well? Finalists in the 2012 Google Science Fair, they are now working together with a pharmaceutical company to bioengineer mosquitoes that would carry a West Nile virus vaccine. As the NYT article says, “What is its ecological niche anyway? One entomologist (has said) that we don’t even have a great understanding of mosquitoes’ place in our ecosystem, because we have focused our efforts on killing them rather than observing them. Having said that, I still won’t be using my humane bug trap when a mosquito wanders into my house.